Nothing enhances a brand more than a great customer experience. There are many ways to achieve this: a great product and eye-catching website for starters, but also an impeccable customer service — something that’s often overlooked. But how do you provide great customer service on a website? A responsive email team, perhaps, but nothing beats a real-time conversation with a real human. I’m talking, of course, about live chat. Not only does adding live chat to your website increase sales — it’s the quickest way to neutralize buyer objections — but it also allows you to provide great aftercare, so users can get the most from your products and services. That means more satisfied customers and more glowing reviews, and this will boost sales down the line, too. By now, I hope you’re sold on the benefits of live chat. Today I want to show you how to add live chat to your website, using Pure Chat. To install the Pure Chat plugin, navigate to Plugins > Add New. Search for âPure Chat,’ then click Install Now on the first plugin returned. After installation, click to Activate Plugin. Next, head to the Pure Chat menu item, and click on the Pick a Widget button. Now you’ll need to sign up for a Pure Chat account. This is completely free of charge and should take no more than a minute. After signing up for Pure Chat, the live chat functionality will automatically activate on your website — access your website to test this out. The default Pure Chat window is stylish and commands attention, making it a great way to encourage visitors to interact with you. Now that you know everything is working, you can use Pure Chat to assist your visitors. Your conversations are handled from a dedicated dashboard — not from within the WordPress dashboard. The interface is really clean, however, and it’s really intuitive to use, so you should feel comfortable in a matter of minutes. You can customize your Pure Chat window by navigating to the Manage tab in the top-right corner, then clicking Chat Widgets > Customize. This means you can create very different looking chat windows. Try to create something that fits with your brand image. Using the many tabs at the top of the screen, you can also configure the appearance of the in chat window, which visitors will see during your virtual conversations. There’s also a Trigger tab, which lets you specify the criteria for a chat window to open automatically — you can select time-based triggers, or page-based triggers by specifying internal URLs. When you’re done, just click Save. The changes are applied to your website automatically. From within the Manage tab, you can also look at your live chat statistics, view transcripts, create new users, and create canned responses to often-asked questions. 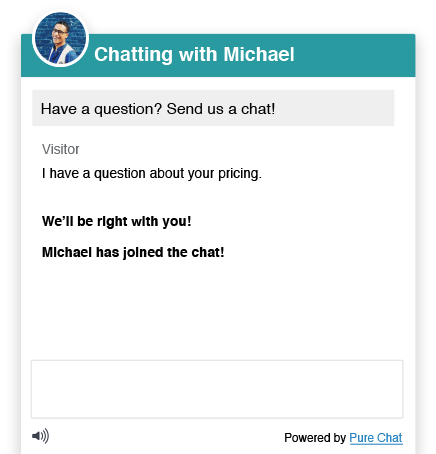 You can chat with your customers from the Pure Chat dashboard. The live chat functionality is activated whenever a chat operator is available — to set your status as available, just click on the Unavailable button at the top of the screen. This will change your status to Available. 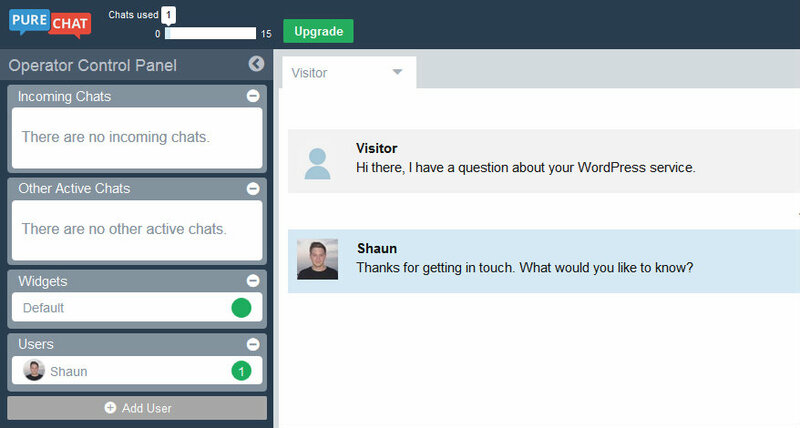 Now when a visitor accesses your website, they can click on your chat window to communicate in real-time with you. When a message is received, Pure Chat will play a notification sound. Click on Incoming Chats to view your received messages. Now you can use the Pure Chat interface like an instant messaging service to talk directly to your visitors. This is what the chat looks like from your visitors’ perspective. 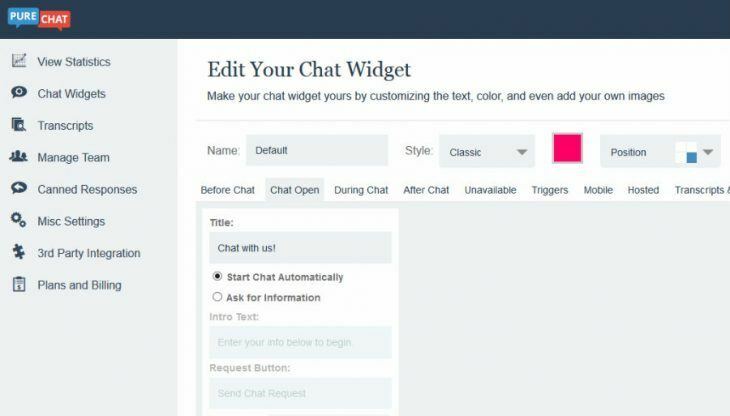 If you want to add live chat functionality to your WordPress website, Pure Chat is a great option. I’ve tested out a few different live chat plugins, and Pure Chat has been my favorite by far. The service is easy to use — on the front- and back-end — and the chat windows look really stylish, with lots of customization capabilities. If you want to test drive Pure Chat, you can use it for up to 15 chats per month free of charge — this might be enough for low-traffic websites. If you want an unlimited number of chats, Pure Chat is available from $4.99/month. Are you using Pure Chat? Share your experiences in the comments below!